Yet another of the little jewels from Venetian domestic architecture (Trincanato and Salvadori) are these dwellings to be found in this corte. As I recall the well was hexagonal in shape. 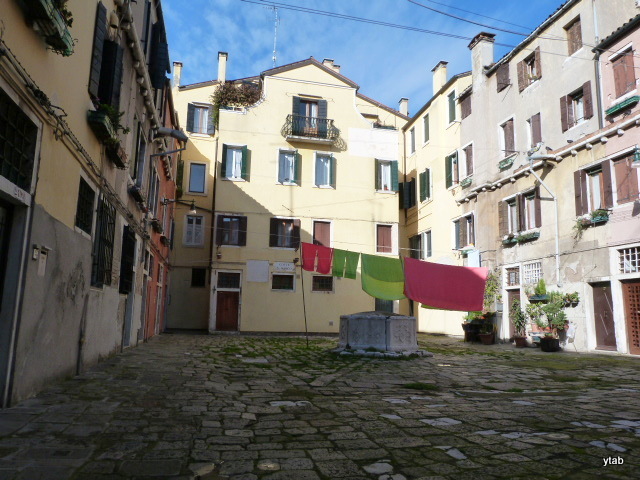 Those masegni (paving stones) look to have been around for a few centuries. This inscribed marble will give some of you an hour or so of deciphering fun! The dwellings were originally built as working-class housing, and they still retain a humble appearance. What a nice surprise to find you at the door, Shell. Come on in, I just baked some cookies! Lovely photos Y. It was very nice of them to hang those pretty green and pink linens up for you! I might have to get my mitts on that book. You can stop in the bookshop after a snack around the corner, Susie! On my first visit there, the whole place was being dug up to lay new drains or cables or some such. But my next visit was in November, last year, and I took a couple of photos almost identical to yours, Yvonne. 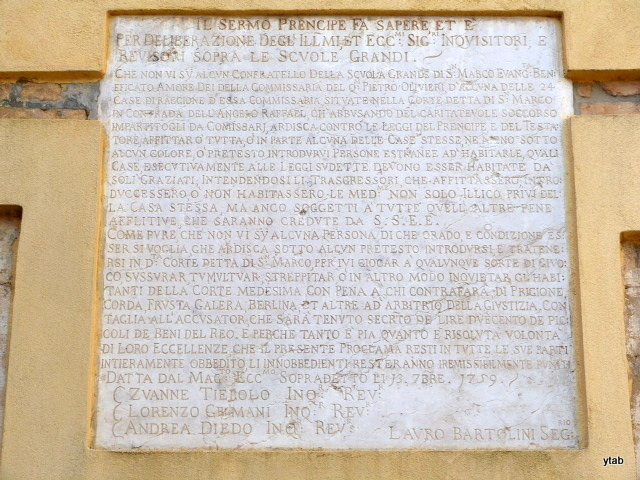 The plaque is dated 13 September 1759. I had noticed that date, Bert, but Signora Trincanato unfortunately made no reference to it in the excerpt. If I got busy and translated that particular marble, all would no doubt be revealed. Just got email that my copy is on the way. I’ll let you know when it gets here. I did it cara Yvonne…..I bought a copy. YES!!! Great post!! It’s just fun to read about these places, and then to see them when you’re in Venice, Linda. Enjoy! I really covet the hard copy Italian edition, Randallo, but it wouldn’t get anywhere near the use the little book does! 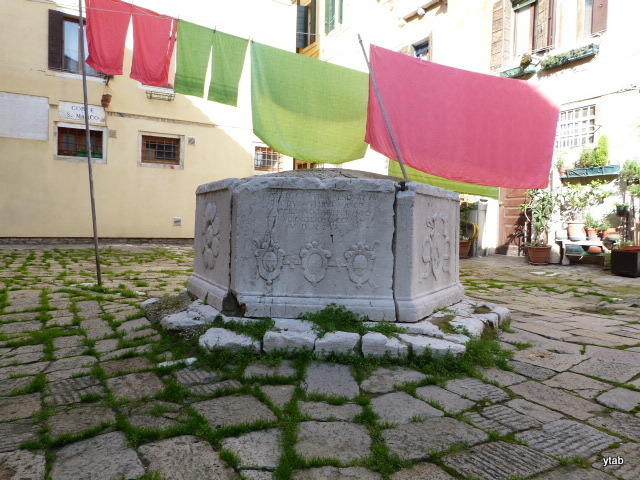 I especially liked the well head, and the paving in that corte. Ralphie! You were in the Spam folder in between an ad for Viagra and another that promised me wealth untold. Phew, you keep interesting company. Thank you for unspamming my comment. Yes, it was interesting, but listening to hours of sales pressure gets boring after a while. Fabulous pics. I love the colours. Venice offers so much for the eye to enjoy, PN. Colour, texture, details and movement are everywhere around you. I’m looking for all these places on the map. Is it worth a day trip to Padua whilst we as in Venice? Hi, Andrew. How long will you be in Padua? If you can spare the time, it’s certainly not a long trip to Venice by train. Depending on your time in Venice, and the hordes you might encounter, a vaporetto trip the length of the Grand Canal is a nice way to see many of the palazzi, and to appreciate how busy that water way is. It’s not a pleasure if you’re crowded into the vaporetto like a sardine. If you want to see the Piazza San Marco, try to go in the late afternoon, after the cruise and tourist bus mobs have left. Please feel free to ask questions, there are a number of people here on my blog who will give all sorts of tips. Yes, it’s worth going to Padua, I believe. The Scrovegni Chapel, the Basilica and just the general city will repay you for a quiet, slow visit there. It’s pedestrian friendly, which is a treat. I look forward to hearing about your visit. Are you going elsewhere in Italy? Yvonne, can you please tell me where I can obtain a copy of this booklet – it is fascinating to be able to date the buildings and to find out their history. Thanks for keeping us so well informed! Of course I’m going to go ahead and buy the cheap one(after shipping and tax it comes to $10.71)….it’s used and says it’s “damp stained” but the other copies are $34.45 and up. If it’s too bad I can always send it back. Lovely picks as usual dear friend. I wonder if that will turn out to be the complete book, as the booklet I have is an excerpt translated to English. It’ll be fun waiting for the delivery! 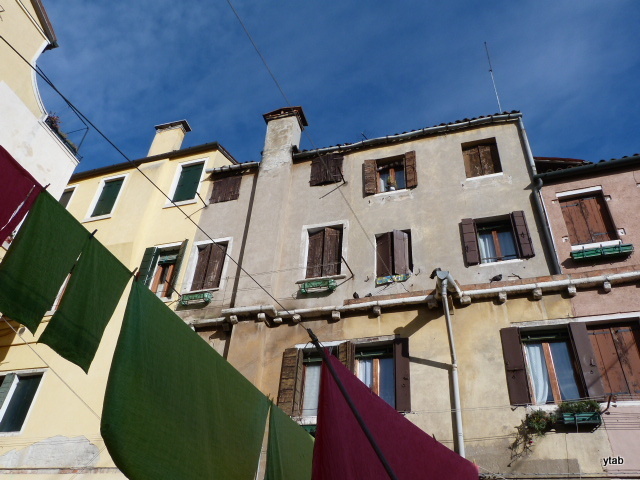 Fascinating insights to a beautiful area of Venice, thanks! I’m so happy I stumbled across that little booklet on domestic architecture in Castello and Dorsoduro. It added a lot to my last 2 visits, Liz. 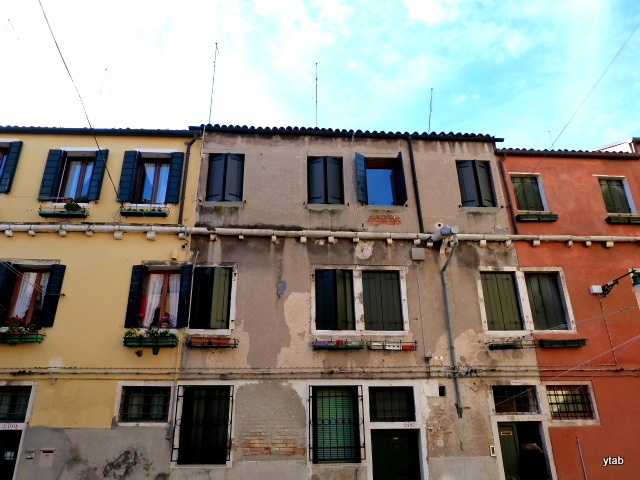 Isn’t it great how guides and guidebooks can bring that extra joy to such a beautiful city as Venice! Its the history trivia that brings the city to life for me. Glad you enjoyed it too!! Very interesting architecture. All Your photos are so beautiful. Thank you, Sartenada. I do like your blog, very much!